Ok, so I am totally interrupting my Feeding a Family of Five on $100 a Week series to tell you about something so amazing. I could make the story long, so I am going to try to keep it short for you. For those of you who have never heard of Young Living, it is a company who makes the BEST essential oil, as well as some other products, with all top quality, organic plants. You can read all about their farms, distilleries, and values at www.youngliving.com. Everyone who knows me or reads my blogs know that I am a natural person. I like to live with as few toxins as possible. This includes the food I feed myself and family, household cleaners, and medications. This is where I have run into some problems. You see, I am ok with suffering through a headache, fever or cold and letting my body's immune system deal with it. But, once I had children I had a really hard time watching them "suffer" so I didn't let them. I cracked down and gave them medications; antibiotics, over the counter fever reducer, even allergy and asthma medications. Well, that has all changed. Thanks to Young Living! I am on a journey to completely change my medicine cabinet! I have so much to share with you! I am going to take it one step at a time with my blog posts. I don't want to over load you with information! So, today I am here to tell you how I came to use Young Living essential oils (YLEO). My mother-in-law uses YLEO's and a while back she gave my husband and I a couple different oils. Honestly, I think it was at Christmas time a year or two ago. She gave us a little card telling us how to use them. Those oils went in my kitchen cabinet and sat. I was as SKEPTIC! I did not believe these oils really worked! I really didn't even think about them. I knew what they were for, but never thought about using them. That is until a few months ago. I had a migraine. I get them monthly. I believe they are caused by hormones. I always got them while I was pregnant. With 3 kids and a traveling husband I did NOT want to suffer through this migraine so I went to the medicine cabinet and guess what...We had NO pain reliever! Then I remembered the little brown bottle of Young Living Peppermint Oil in my kitchen. (I should mention we had occasionally put this in our tea to flavor it). And I remembered I could use it to relieve a headache. Did I believe it would work? NO! Was I desperate? YES! So, I reached for this little bottle, put a drop on my finger and started massaging it in to my temples. I did not dilute it, just rubbed 1 drop on 2 temples. Then I sat on the couch for a few minutes. To my amazement about 5 minutes later my headache was GONE! I COULD NOT BELIEVE THIS WORKED! For the next few days my hormone headache returned. 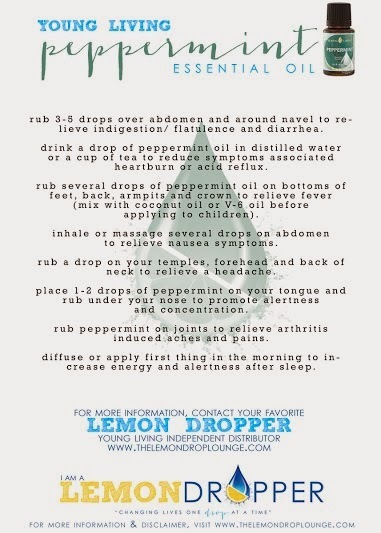 And every time I used the peppermint oil and every time my headache went away. I told my husband I may be a believer, but I had to test out some other oils for different uses before I could really believe in YLEO's. The next essential oils I used were: Lemon, Lavender, Purification and Panaway. About 1 month later I was a true believer in Young Living. That's what's brought me here today. I am now a part of an amazing group of Christian women, who all want to live naturally and tell everyone we know about it! I do not believe that it's by chance that I became part of this group. I believe God has a plan and it begins with bringing all of us together for a reason. I am a Lemon Dropper! What's that? Visit www.lemondroplounge.com to learn more. In an effort to keep this post from getting too long (if it isn't already) I am going to leave it about Young Living's Peppermint Oil only. If you want to learn how to save 24% and order with wholesale prices contact me. Leave questions in the comment section. I will answer asap.